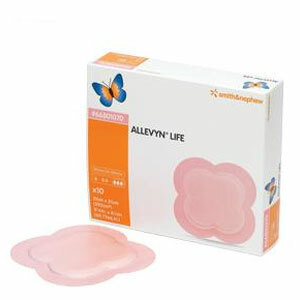 Smith and Nephew Allevyn Foam Model 66801070 Dressing 8 1/4"x8 1/4" has an advanced layered design, which is made up of a composite hydrocellular foam pad, held between a perforated silicone gel adhesive wound contact layer, and a highly permeable waterproof outer film. Box of 10. Smith and Nephew Allevyn Foam Dressing 8 1/4"x8 1/4" has an advanced layered design, which is made up of a composite hydrocellular foam pad, held between a perforated silicone gel adhesive wound contact layer, and a highly permeable waterproof outer film. Box of 10.